The planet Freed has been conquered by the Vega Star Alliance. Duke Freed, royal prince of the planet Freed escapes with the most sophisticated war machine the super science of Freed could create: UFO Robo Grendizer. Fleeing to Earth, Duke takes on the name Daisuke Umon and lives on a ranch with Grendizer sealed into a mountain never to be used again. However, the Vega forces have created a base on the dark side of the moon and the recapture of Grendizer and the conquest of Earth is in their plans. Aided by Koji Kabuto, former pilot of Mazinger Z and now member of the UFO Research Institute, Duke Freed must pilot the robot he hates to fight for the defence of his new planet. Opposing him is the might of Emperor Vega and his henchmen. Goldorak is the French name for Grendizer (Grandizer) from the anime UFO Robot Grendizer which was shown in the USA as part of Force Five. Unreleased in the US, Goldorak is more than likely the rarest of the Mattel Shogun Warriors released outside Japan. This Shogun is usually seen in a European, French or Italian (as Goldrake) version box and comes with cool accessories: His hand fires rockets (same hand as Great Mazinga) and he carries a double headed, sickle-shaped axe (it comes apart and the pieces are stored in his shoulders) called "Hakken". The molding on this figure is very colorful and true to the Japanese depiction. This Shogun demands ridiculous amounts of money at auction in the US. There appears to be four versions of Goldorak. Version One is the Japanese first version (Called "UFO Grendizer" in translation). It came with 2 fists rather than the missile firing fist (the same missile firing fist came with Mazinga). The right fist fired off via a button below the shoulder. The chest "v" is a separate red plastic piece, as are the red knee pads and girdle below the waist. Red decals adorn foot spikes (on the tops of the feet), and the crotch arrows are painted yellow in molded plastic. He came with 14 triangular-vaned missiles and two very defined, white plastic shoulder scythes (Hakken). This version came to the US via oriental grocery stores and is very rare. As far as I know, this is the only version to be sold at retail in the US. Version Two is the rarest of the Mattel distributed versions. This version comes with a missile-firing hand and only 10 clip-vaned missiles. The foot spikes are dropped and the neck ring is simplified to a flat disc. Also, the red girdle is molded into the black body plastic and unpainted/unadorned (instead of being a separate piece). Version Three is the most common Mattel version. This version has a red decal replacing the chest "v" and knee pads. The neck looses the ring attaching the head to the torso...the neck now fits loosely on the shoulders. The yellow, moulded crotch arrows are replaced by a decal. The scythes are simplified to a more ridged "t" shaped channel plastic. Version Four is the strangest version I've seen! 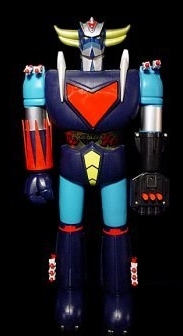 For some reason, Goldorak went into production in France (rather than being imported from Japan...possibly Popy quit producing the toy but there was enough demand in France to warrant local production). The body is 1/2" smaller in height and thickness, and moulded in dark blue instead of black. On the back, where the Popy logo, "Copyright Dynamic Kikaku" and "Copyright TOEI DOGA" used to reside, is now embossed "Made in France" upside down! Overall, the mould lines are shoddy and less refined. (especially the head). This is possibly a bootleg. No Batteries! No Electricity! Fully Assembled! Axes and rockets not for use with all SHOGUN© Warriors. Mattel S.p.A., Italy. MADE AND PRINTED IN ITALY. All Rights Reserved. SHOGUN® is a US registered trademark of Mattel, Inc.